The Hamptons may be an exclusive, seaside resort community on New York’s Long Island, but there’s something about the quintessential design style this area’s homes are known for that has captured fans from around the world. Just the term “Hamptons” has become indicative of a distinctively beautiful décor style that designers and homeowners are drawn to. Perhaps it’s the soft, soothing color palettes paired with the solid, well-made furniture they find appealing. Maybe it’s the naturally chic impact this style creates in a home. It could be the immediate sense of inviting warmth that emanates from these homes. Whatever it is, the quest for a Hamptons-inspired home has led the design world to embrace the one-of-a-kind elements that define this style, as they work to recreate it and make it work in their own spaces. How do you design in the Hamptons style and make it come together? How do you create a space that’s cohesive and reflects everything you love about this style? There’s something so fresh and calming about a Hamptons home, whether it’s really located in seaside Long Island, or it’s halfway around the world. How is that conveyed? The colour palette is an essential element. 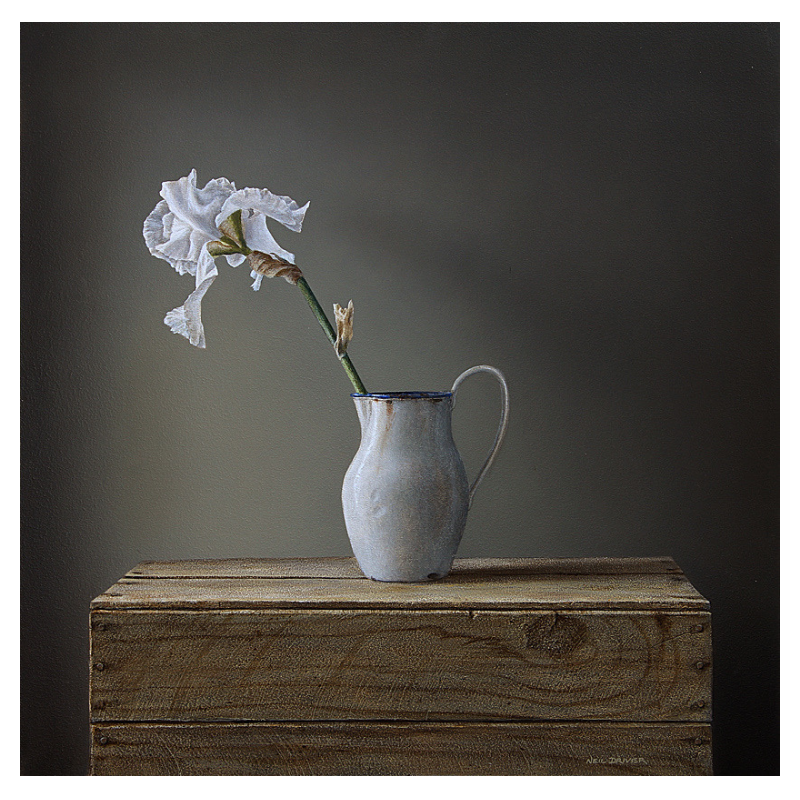 If you want that same sense of airy and simple sophistication, choose light, neutral colours. This can include whites, creams, and beiges. These create the perfect backdrop for the rest of your design, and they ensure that a space feels breezy and open. With a neutral colour palette, you’re also going to set the tone for a sense of relaxation which is so vital in Hamptons homes. 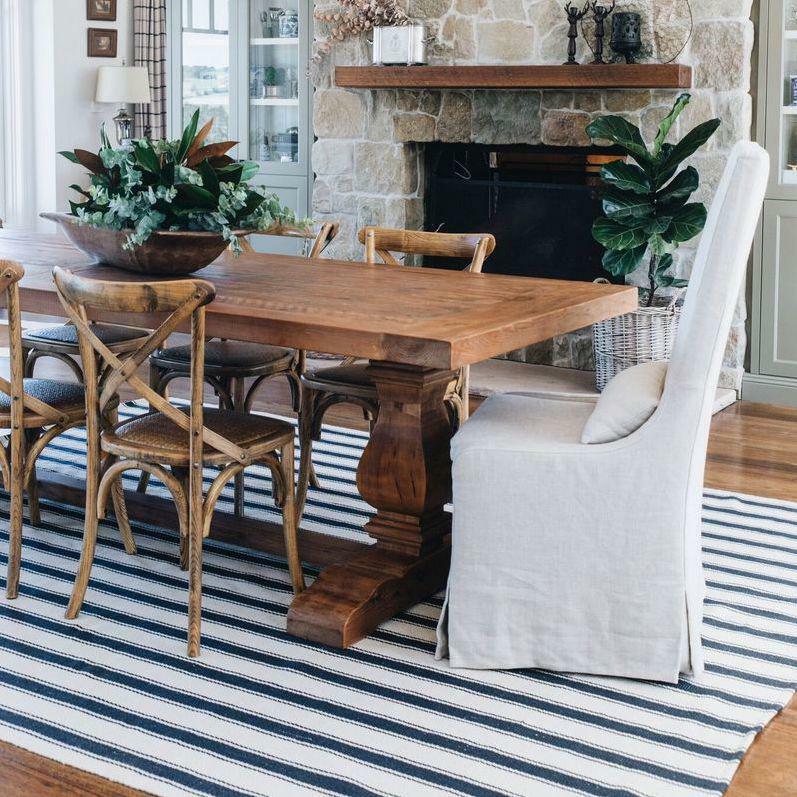 While the primary colour palette may be one that’s based on neutrals, many homeowners like to infuse a nautical element into their design, with the addition of shades of blue. Just a pop of duck egg blue here and there goes a long way in terms of creating a nautical concept, which is commonly found in Hamptons homes. 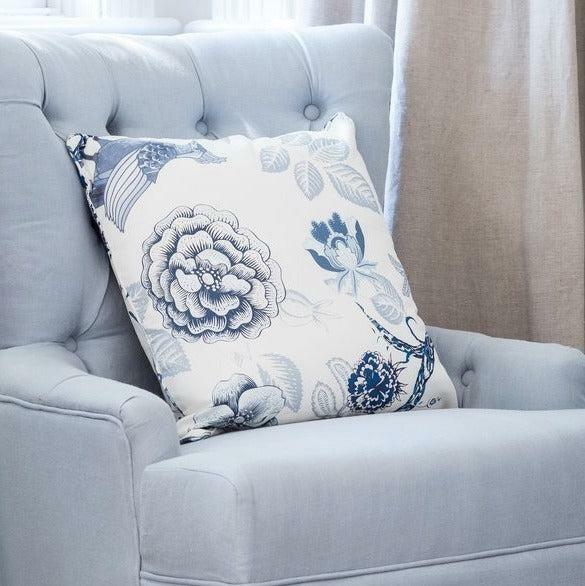 For example, you might add a few blue throw cushions to your bed or sofa, or a classic blue-and-white vase as a shelf accessory. 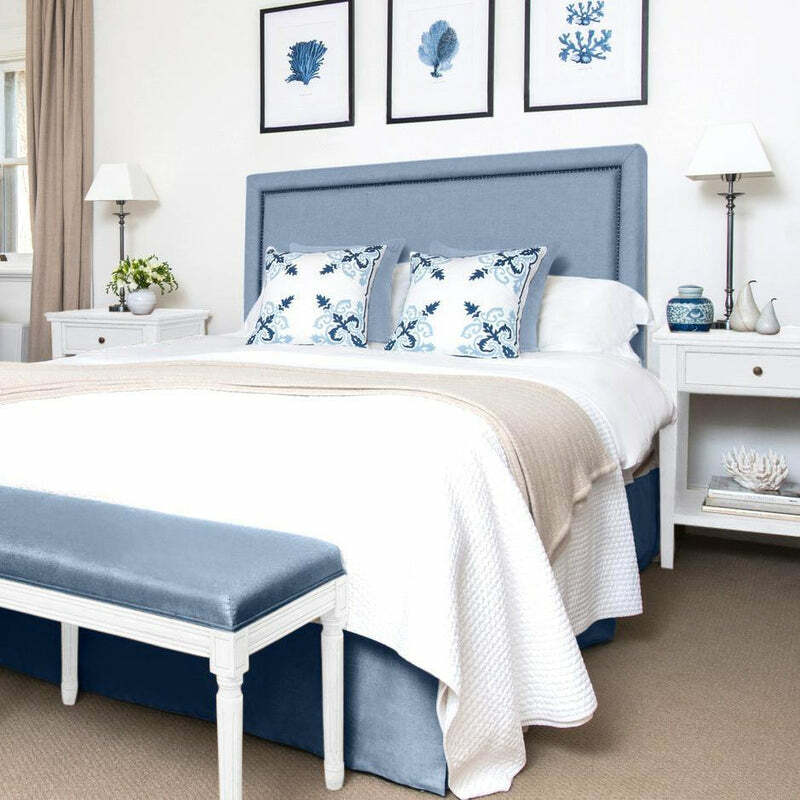 Along with shades of duck egg blue, another excellent accent colour you might consider in a Hamptons home is nautical navy. When selecting flooring colours in a Hamptons home, rustic, hand-scraped planks tend to be the option of choice. If you want a very soft colour palette to continue to the flooring, you can select something like a light, washed pine. If you’d like to add some more contrast and sophistication, you might choose a very rich, dark flooring colour that will contrast with the lighter tones found elsewhere. The fear with Hamptons decorating for some people is that the room will look too boring or monochromatic, particularly with such a heavy emphasis on a neutral colour palette. This can be alleviated through the integration of rich patterns and textures. Adding different patterns and textures can ensure a design maintains visual interest, even in the absence of the use of bright colours. For example, choose fabrics and materials like linen, jute, soft cotton, and sisal. All of these materials add dimension and depth to a room and balance the simplicity of a mostly neutral colour palette. You can also consider throwing in a few patterns throughout a room or an entire home. 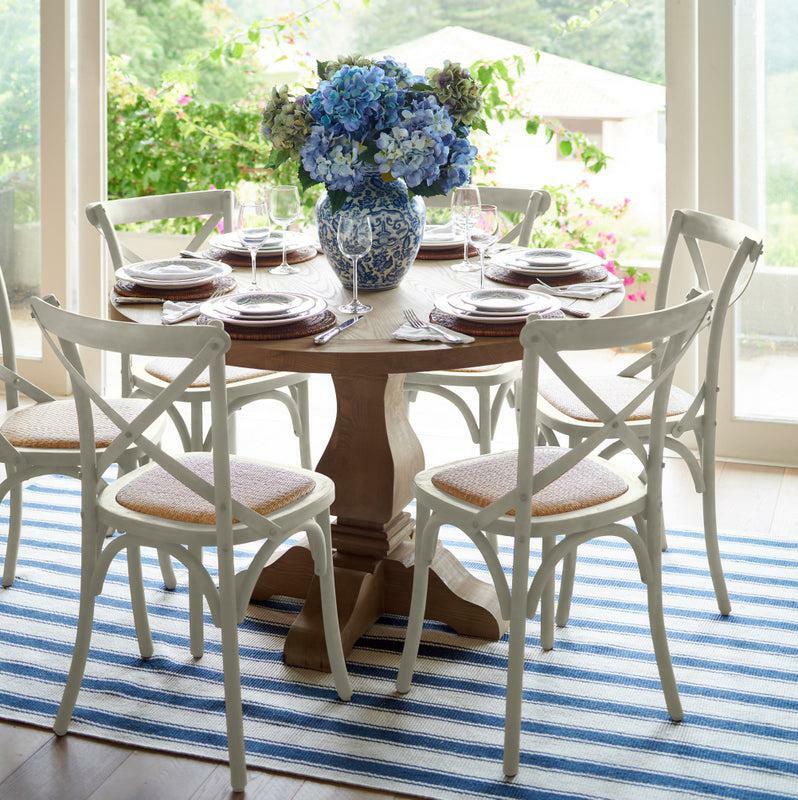 Nautical stripes and florals are two patterns that can work particularly well in a Hamptons-inspired design concept. 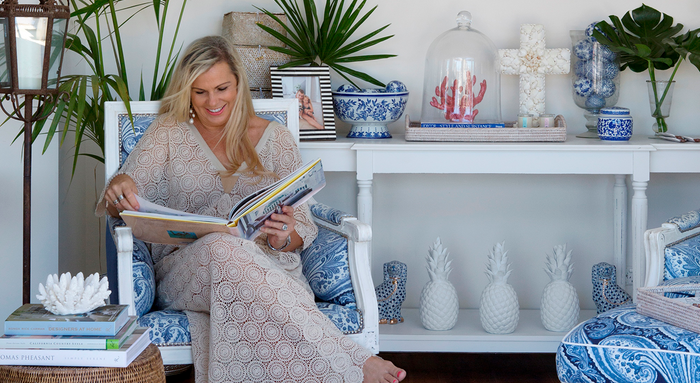 When textures and patterns are layered, it doesn’t just create a more exciting and inspired visual experience, but it also tends to make a home feel more comfort, and comfort is key in the Hamptons. When you walk into a room that’s designed in the Hamptons style, it inherently feels like somewhere you want to relax and unwind at the end of a long day. It feels refined but simultaneously inviting, and the furniture should reflect these goals. Choose oversized furniture pieces, including generously-sized sofas and club chairs. Stick with a neutral color palette, and opt for beautifully diverse textures in your furnishings as well. If you’re going to splurge in one place of your home design, furniture is often the best place to do it. The goal is to find items that look as if they’ve been around for many decades and still maintain their original beauty and character. They need to be not only amply-sized and comfortable but also well-crafted with quality materials. 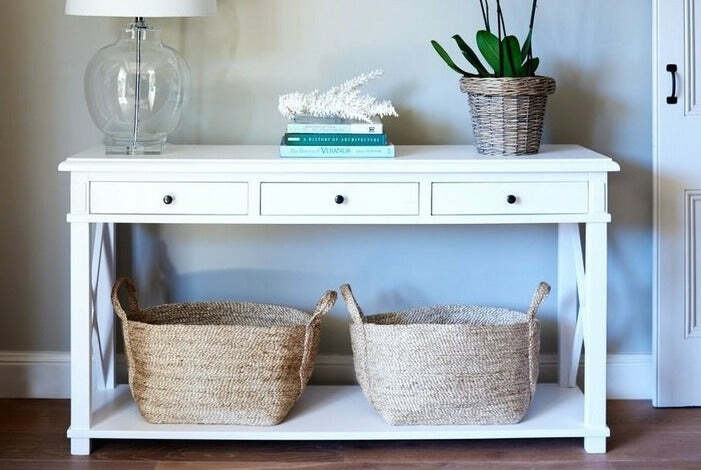 Along with the upholstered items, adding in natural wood furniture, such as end tables and expansive coffee tables works well in a Hamptons design, as does the inclusion of furnishings made from natural materials, such as wicker and rattan. 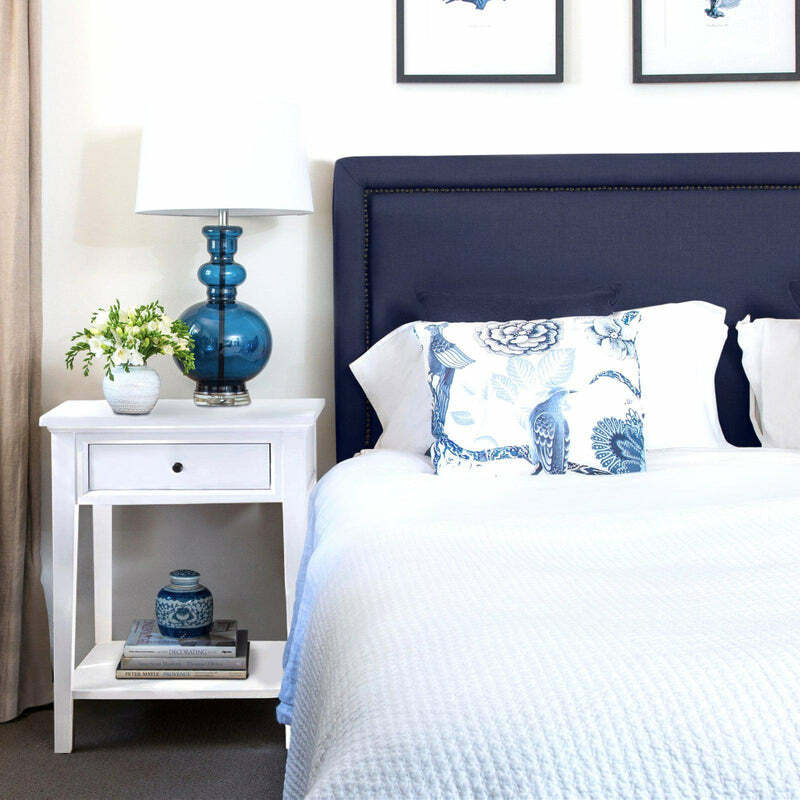 In bedrooms, statement-making headboards work beautifully, as does tufted detailing and layered bed linens. The ultimate goal when placing furniture should be a sense of symmetry and balance. Lighting is an important component of completing a true Hamptons-inspired design project. First, think about natural lighting. It should be allowed to flow freely into a home so limit window coverings. If you do add curtains or panels, make sure they’re light or even sheer, to avoid blocking out any light. If you want to go more dramatic with your curtains, consider very long, flowing panels, as long as they’re still a light-coloured fabric. Regarding artificial lighting, a layered lighting concept is ideal. Harsh overhead fixtures can make a room feel drab, whereas the soft glow of a beautiful chandelier can be relaxing. Chandeliers can also become a focal point in a Hamptons design, and having a focal point delivers that sense of balance that is critical in Hamptons homes. Also think about adding sconces or table lamps, which also cast a soft glow and can make a style statement on their own. When choosing lighting and accessories, draw from natural inspirations. For example, think about the elements you would find walking along a beach. Sea glass, shells, coral, and driftwood are all good options. Classic Hamptons style derives its sensibilities from the outdoors and seaside living. Neutral colours, symmetry and balance, high-end furnishings, naturally-inspired accessories. These are all essential elements of Hamptons style. They come together for a look that’s timeless, and it’s that sense of timeless that continues to draw people to this elegant style. These elegant designs take on a carefully collected look as if a family has been curating beautiful hand-crafted furnishings and accessories over the years, and the result is a warm and cozy space where everyone gathers and feels comfortable. All furniture and homewares available from www.lavenderhillinteriors.com.au.